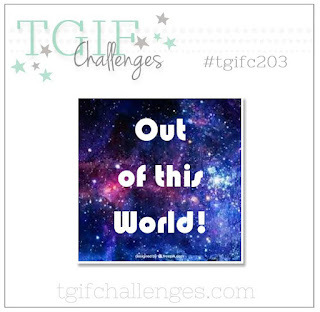 We taking this #TGIF203 challenge "out of this world!" How much fun is this theme? Tons! I had first thought to handpaint a deep space water color background, but then I remembered the Twinkle Twinkle DSP which fit the theme perfectly. A cheerful bright white star pattern paper was perfect for my focal point--a garland of sparkling stars. For my sweet sparkling garland I cut six stars using one of the star piece from the Wood Crate Framelits. 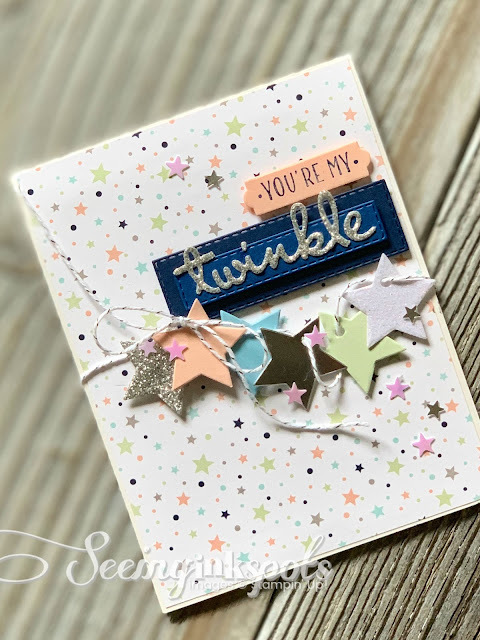 In true Elizabeth style there are both foil and glimmer stars in silver and white along with a one star each in Balmy Blue, Petal Pink, and Soft Seafoam. To string them all together I used the Silver and White Baker's Twine. Let's talk about the sentiment I created for this card. I wanted something unique so I searched my stash of supplies and took a close look at the Well Written Framelits. 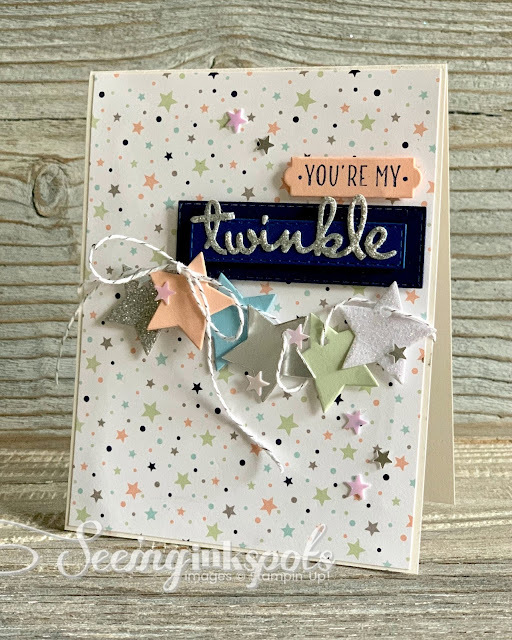 I cut a variety of words from Silver Glimmer Paper and clipped the letters apart to rearrange the word "twinkle." Backing my custom cut greeting is a panel of Blueberry Bushel layered on a piece of Night of Navy, both cut with the Rectangle Stitched Framelits. To add just a bit more flair I sprinkled a few Twinkle Adhesive Backed Sequins. Perfect! I love your approach and this star banner is absolutely adorable. Twinkle, twinkle! I went with the deep space watercolour panel lol, but I love your thinking! This gorgeous card is just perfect for this challenge!